Checks my new sidebar look. Thank you for the swift shipping! And Mark's wearing your new hat! Maybe you should hire him to be a model? Mark, the photo is wonderful! (and so are you.) Thank YOU. Oh wow! Now that's a great hat to wear while napping! 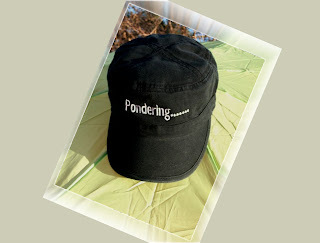 Hmmm, my Mom loves hats (and that looks like a neat one, plus the logo:). I'll figure something out, finances have been weird, by the first though, I should be able to do what I had hoped to do... You do work I really enjoy. Did I hear a call for 'models'? Joan, I love that idea. ha! Hug and smooch from Doom? Goodness! Berry, you're on the list.